Joomla 3.8 – Error You are not authorised to view this resource. I got this error because the menu item was set to guest and after a user logged in the error would show. The reason the menu item was set to guest is because I was using it for a login button. The other menu item was “logout”. When the user logged in it showed and the “login” was unpublished . I set the user to “Publisher” and “Public” and I redirected the login on the menu item to a “How to update your site” page. I quickly found this post. I backed up the form. Uninstalled the Chronoforms6 component and plugin. Downloaded the latest versions and restored the form. After that everything worked fine. 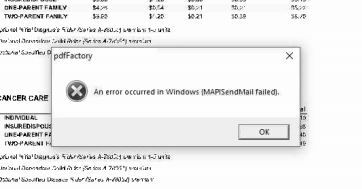 pdffactory an error occurred in windows (MAPISendMail failed). This error looked like this. This error was fixed by going to the following path and renaming “MSMAPI32.DLL” to “MSMAPI32.old”. After that the program worked normally. The path the DLL on Windows 10 is “C:\Program Files (x86)\Common Files\system\MSMAPI\1033”. Divi’s portfolio modules and projects component make adding the project / portfolio a breeze. I found a short code from Surbma that allowed me to quickly add the project tags to the page. The issue I had is when the user clicked on the tag the projects were displaying as single-column blog style and I wanted the columned style the module displayed. The page got me in the right direction. This was so close to what I wanted. The boxes were not totally lined up so I ended up implementing “Flex” in the CSS to make the boxes fit a little better. I used the following article to guide me. The next issue was being able to build this page like the other pages I had built in the Divi builder. I needed to add back the Yoast Breadcrumbs and this article helped. ” .The following page helped me determine the right taxonomy for page of linked projects by tags. I learned since Joomla 1.5 that updating is a must. Make a backup and install the update. You never know unless you try. Today I saw an article that gives a great reason for updating to 3.8….answer is security. I needed to add a video to page/article in a Joomla! 3.8 site. I saw the JCE advertises as being able to do this with just a URL. I love the way WordPress embeds YouTube videos and hoped it would be the same experience. It wasn’t, but it wasn’t bad. The first issue I had was my subscription was expired. That was a cheap fix. Less than 30 bucks and ready. After installing the Pro component I didn’t see where I could add video yet. I tried just the URL but that didn’t work. I solved my issue by adding the special toolbar in the JCE to the normal JCE toolbar. Here is a video of how to set this.